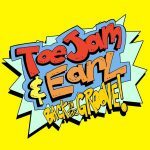 Back in 2015, ToeJam and Earl: Back in the Groove entered kickstarter. Now it’s out and… amazingly it’s quite good. As you begin, you choose one of 9 characters – essentially ToeJam, Earl, variants of ToeJam and Earl or one of their friends. The goal is to try and find all their spaceships which have crashed on Earth so they can return to Funkotron. And it’s weird. Very, very weird. Playing as “Old-School Earl” (which is always referred to as exactly “Old-School Earl” as a name, which is funny) I discovered initially that each character has their own benefits so it’s a decision more than just choosing the coolest. My Old-School Earl for example can eat anything essentially which is good as I don’t like to be choosy in games. 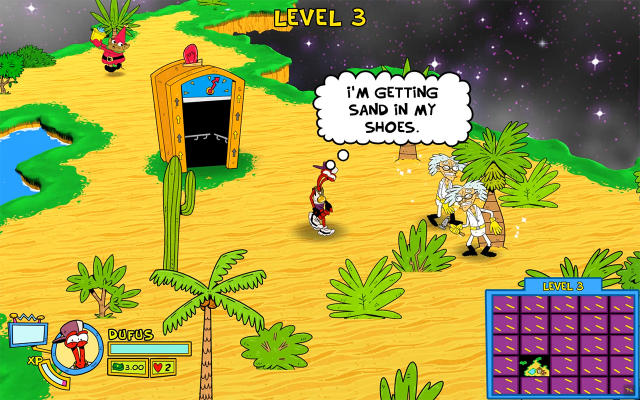 It’s a hark back to the original ToeJam and Earl many, many years ago really. The game takes place in an almost over-the-top isometric view, looking down on your characters as they move about the map. The goal is to find things, and you do that just by walking about. That’s kind of all there is to the game – avoid enemies (or throw things at them), search bushes to find food, money (to buy stuff with – duh) or spaceship parts then hop on the elevator to the next level. Cleverly, each level is a plane which kind of ‘floats’. Fall off and (neatly) you can end up on the level below (even in co-op). Hidden paths can be found by approaching ends of the level which does add an exploration vibe to proceedings. If it were any other game you’d be writing it off at this point by saying ‘Is that it?’. Well yes, it is. But ToeJam and Earl does it with so much style that really helps elevate this (no pun intended) to the next level. The music is funky. Offbeat jazz riffs and beats blast away constantly. Characters are hip, yo, and there is just a cool vibe flowing throughout. The art style is vibrant and ‘squiggly’ – hand drawn and nicely animated although at times it can feel a bit like you’re playing an upmarket flash game. And then the weirdness ramps up a notch. Things you might see – ice creams to eat. Ok, not so bad. An official looking town crier type fellow who ‘judges’ you. A hula girl which if you go too close to, breaks out into dancing and forces you too, leaving you vulnerable. Ghandi running around, preaching about peace and stuff. I mean, what now?? Local co-op is where it’s at really, cleverly in split-screen the screen splits and comes together as the characters do. This really helps you enjoy the craziness of it all though as you come across things that are simply too bananas to explain to anyone else so are best shared in the moment. Replayability is here too, whilst not very hard or long, it is essentially a rogue like with random generated levels (a mode which unlocks later) meaning you have never truly seen it all, but this longevity will depend on how much you like the art style, ToeJam/Earl and exploring in games.